White dwarf stars, the remnant cores of low-mass stars that have exhausted all their nuclear fuel, are among the most dense objects in the sky. Their mass is comparable to that of the sun, while their volume is comparable to that of Earth. Very roughly, this means the average density of matter in a white dwarf would be on the order of 1,000,000 times greater than the average density of the sun. Thought to be the final evolutionary state of stars whose mass is not high enough to become a neutron star — a category that includes the sun and over 97% of the other stars in the Milky Way — they are dim objects first identified a century ago but only in the last decade the subject of broad study. 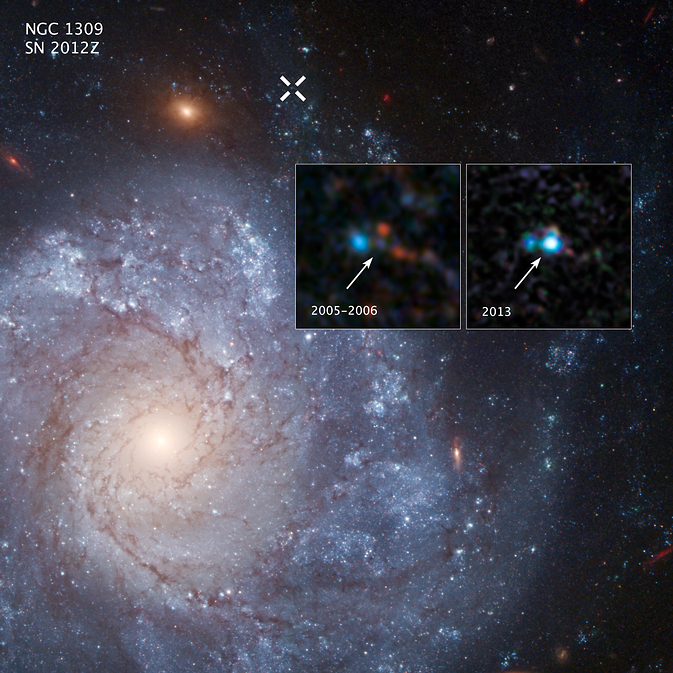 Now a team of astronomers led by Stephane Vennes of the Czech Academy of Sciences has detected another zombie white dwarf, LP-40-365 , that they put forward as a far-flung remnant of a long-ago supernova explosion. This is considered important and unusual because it would represent a first detection of such a remnant long after the supernova conflagration. This dynamic is well captured in an animation accompanying the Science paper that describes the possible remnant. A supernova — among the most powerful forces in the universe — occurs when there is a change in the core of a star. A change can occur in two different ways, with both resulting in a thermonuclear explosion. Type Ia supernova occurs at the end of a single star’s lifetime. As the star runs out of nuclear fuel, some of its mass flows into its core. Eventually, the core is so heavy that it cannot withstand its own gravitational force. The core collapses, which results in the giant explosion of a supernova. The sun is a single star, but it does not have enough mass to become a supernova. The second type takes place only in binary star systems. Binary stars are two stars that orbit the same point. One of the stars, a carbon-oxygen white dwarf, steals matter from its companion star. Eventually, the white dwarf accumulates too much matter. Having too much matter causes the star to explode, resulting in a supernova. Type Ia supernovae, which are the result of the complete destruction of the star in a thermonuclear explosion, have a fairly uniform brightness that makes them useful for cosmology. The light emitted by the supernova explosion can be, for a short while at least, as bright as the whole of the Milky Way. Recently, astronomers have discovered a related form of supernova, called Type Iax, which look like Type Ia, but are much fainter. Type Iax supernovae may be caused by the partial destruction of a white dwarf star in such an explosion. If that interpretation is correct, part of the white dwarf should survive as a leftover object. And that leftover object is precisely what Vennes et al claim to have found. They have identified LP 40-365 as an unusual white dwarf with a low mass, high velocity and strange composition of oxygen, sodium and magnesium – exactly as might be expected for the leftover star from a Type Iax event. Vennes describes the white dwarf remnant his team has detected as a “compact star,” and perhaps the first of its kind in terms of the elements it contains. The team calculate that the explosion must have occurred between five and 50 million years ago. In an email exchange, Vennes told me that he has been studying the local white dwarf population for thirty years. “These compact, dead stars tell us a lot about the “old” Milky Way, how stars were born and how they died,” he wrote. “Tens of thousands of these white dwarfs have been catalogued over this past century, most of them in the last decade, but we keep an eye on outliers, objects that are out of the norm. We look for exceedingly large velocity, peculiar chemical composition or abnormal mass or radii. Vennes says the team was surprised to learn that the white dwarf LP40-365 is relatively bright among its peers and that similar objects did not show up in large-scale surveys such as the Sloan Digital Sky Survey. “This fact has convinced us that many more similarly peculiar white dwarfs await discovery. We should search among fainter, more distant samples of white dwarfs,” he wrote. And that search can be done by the European Space Agency’s Gaia astrometric space telescope, with follow-up observations at large telescopes such as the European Southern Observatory’s Very Large Telescope and the Gemini observatory in Chile. A supernova burns for only a short period of time, but it can tell scientists a lot about the universe. Scientists also have determined that supernovas play a key role in distributing elements throughout the universe. When the star explodes, it shoots elements and debris into space. Many of the elements we find here on Earth are made in the core of stars. These elements travel on to form new stars, planets and everything else in the universe — making white dwarfs and supernovae essential to the process that ultimately led to life. There are many worlds out there waiting to fire your imagination. Marc Kaufman is an experienced journalist, having spent three decades at The Washington Post and The Philadelphia Inquirer, and is the author of two books on searching for life and planetary habitability. While the “Many Worlds” column is supported by the Lunar Planetary Institute/USRA and informed by NASA’s NExSS initiative, any opinions expressed are the author’s alone. This site is for everyone interested in the burgeoning field of exoplanet detection and research, from the general public to scientists in the field. It will present columns, news stories and in-depth features, as well as the work of guest writers. The Nexus for Exoplanet System Science (NExSS) is a NASA research coordination network dedicated to the study of planetary habitability. The goals of NExSS are to investigate the diversity of exoplanets and to learn how their history, geology, and climate interact to create the conditions for life. NExSS investigators also strive to put planets into an architectural context — as solar systems built over the eons through dynamical processes and sculpted by stars. Based on our understanding of our own solar system and habitable planet Earth, researchers in the network aim to identify where habitable niches are most likely to occur, which planets are most likely to be habitable. Leveraging current NASA investments in research and missions, NExSS will accelerate the discovery and characterization of other potentially life-bearing worlds in the galaxy, using a systems science approach. President Dwight D. Eisenhower established the National Aeronautics and Space Administration (NASA) in 1958 with a distinctly civilian (rather than military) orientation encouraging peaceful applications in space science. The National Aeronautics and Space Act was passed on July 29, 1958, disestablishing NASA’s predecessor, the National Advisory Committee for Aeronautics (NACA). The new agency became operational on October 1, 1958. Since that time, most U.S. space exploration efforts have been led by NASA, including the Apollo moon-landing missions, the Skylab space station, and later the Space Shuttle. Currently, NASA is supporting the International Space Station and is overseeing the development of the Orion Multi-Purpose Crew Vehicle and Commercial Crew vehicles. The agency is also responsible for the Launch Services Program (LSP) which provides oversight of launch operations and countdown management for unmanned NASA launches. Most recently, NASA announced a new Space Launch System that it said would take the agency’s astronauts farther into space than ever before and lay the cornerstone for future human space exploration efforts by the U.S.
NASA science is focused on better understanding Earth through the Earth Observing System, advancing heliophysics through the efforts of the Science Mission Directorate’s Heliophysics Research Program, exploring bodies throughout the Solar System with advanced robotic missions such as New Horizons, and researching astrophysics topics, such as the Big Bang, through the Great Observatories [Hubble, Chandra, Spitzer, and associated programs. NASA shares data with various national and international organizations such as from the [JAXA]Greenhouse Gases Observing Satellite.